Hotel Mangala International at Coimbatore City. www.coimbatore.com. 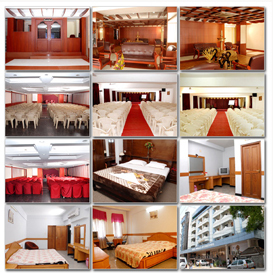 Hotel Mangala International Located in the heart of Coimbatore City and dedicated in your serrvice since 1996. Parallel to cross cut road wack able to central bus stand. An Impeccable business centre provides secretarial service, Indulge in speciality meals especially kerala sea food, best in indian and chinese cuisine. There are 2 permit rooms one at the basement and another at the roof top, banquet hall and 2 restaurants. Hotel Mangala International has two Restaurants Serving Kerala Sea Food specialties / Malabar cuisine / North India / South India / Chinese - Tandoor and Continental Food. Rooms : Hotel Mangala International has 85 rooms AC & Non-AC Deluxe / Super Deuxe / Suite rooms with modern facilites for guest comfort. Banquet Halls : Capacity upto 500 members equipped with Overhead projector, Slide projector Audio / Video & podium. Mini conference Hall : Capacity upto 50 members equipped with all conference facilities. Board Room : Hall of capacity for 25 members with all well equiped Projectors, Audio, Video Systems. Executives with Modern Facilities. Permit room : There are 2 permit rooms one at the basement and another at the roof top with well stocked Bar, offers you a place to relax and enjoy with wide range of Indian made foreign liquors. Located in the heart of Coimbatore City 9 kms from the Airport, 2 kms from the Railway Station and walking distance from the Central Bus Stand. On a Quick Visit to Coimbatore? We Offer the best wash and change stop over. That too on hourly basis! Third person @ Rs.50.00 in both the category. Children : No charge for children under 12 yrs. Taxes as applicable. Offering a wide variety of food open from 0.6.00 hrs. to 23.00hrs.